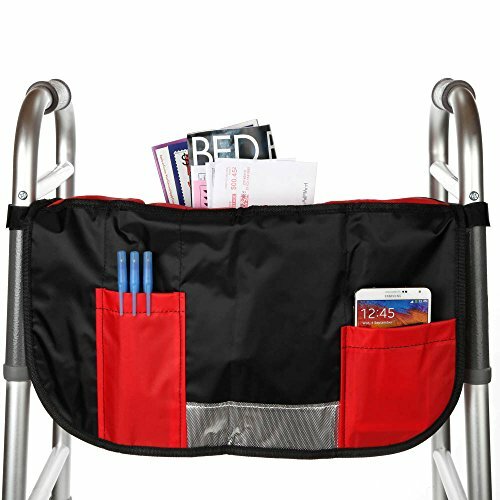 Multiple pockets keep bathing supplies handy and within reach! 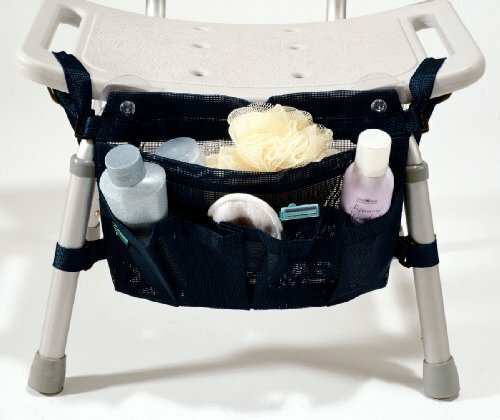 Unique design features interchangeable powerful suction cups and nylon straps to allow attachment to the wall or bathing chair. Spacious storage pockets. Vinyl mesh allows water to drain. The HydroGlyde premium sliding transfer bench and bath/shower chair is the perfect bathroom aid for individuals with decreased and/or painful mobility challenges. 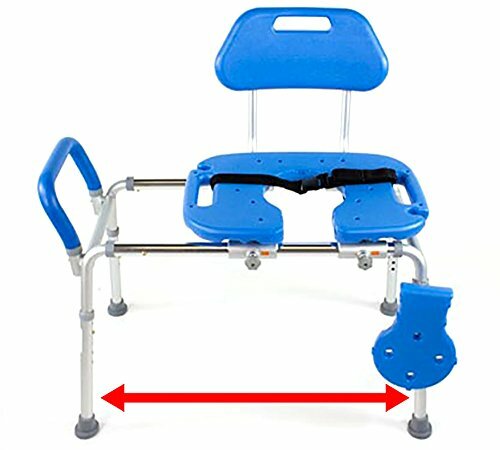 It is the only transfer bench designed to eliminate both falls and skin tears. The HydroGlyde incorporates a unique cut-out seat for superior access to the perineal area for easy, effective cleaning. All surfaces are easy to clean and disinfect. The quick, tool-less assembly and height adjustment feature allows the HydroGlyde to integrate perfectly with virtually every tub on the market. Includes convenient built-in holders for shower wand and cutout insert.The frame is constructed of rustproof aluminum for years of reliable use. 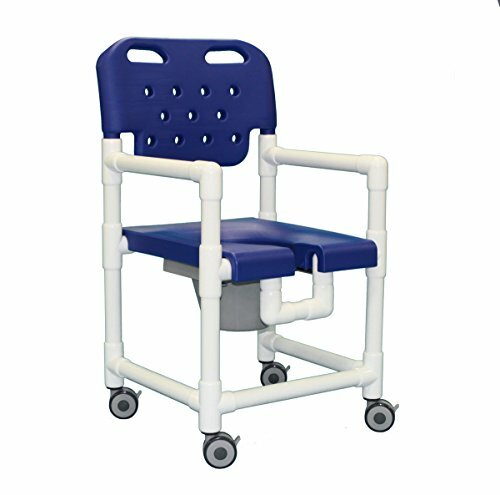 Designed by front-line healthcare workers with decades of experience in safe bathing and transfers, the HydroGlyde is considered a best-in-class transfer bench/bath/shower chair product by nurses, physiotherapists and doctors across the country. 100% reversible, works with both right side and left side access tubs. Seat Belt is included. 420lb Weight Capacity. Overall dimensions (footprint) are 33 inches wide X 20 inches deep. PLEASE CLICK ON THUMBNAIL IMAGE IN TOP LEFT CORNER FOR A DETAILED LINE DRAWING WITH ALL DIMENSIONS. Virtually indestructible blow molded seat and backrest available in Blue, Gray and Red. 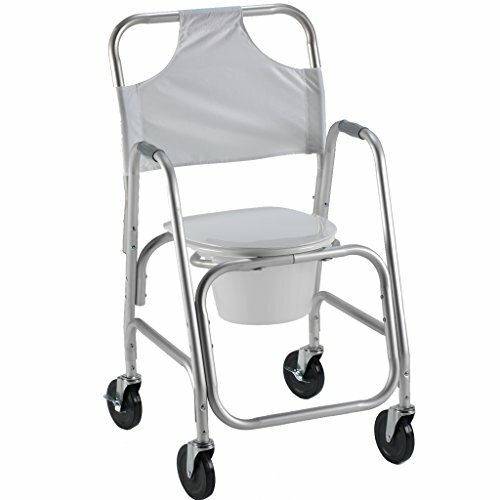 Open-front seat and U-shaped opening in frame allow easy access for bathing care. Special seat design offers unmatched comfort. Snap-on seat lifts off frame for easy cleaning. Never rust, all locking, twin-wheel casters. Backrest push handles for easy mobility. 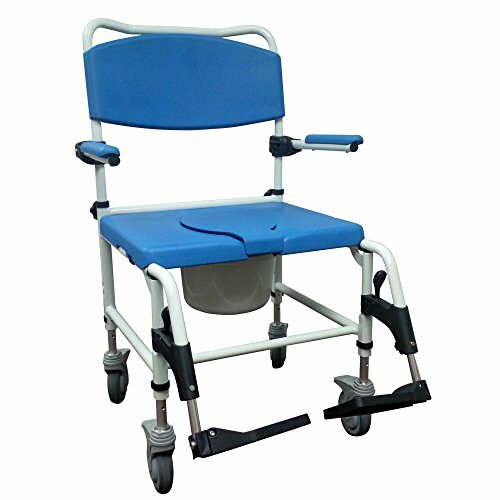 The Personal Care Products #5004 Shower Transport Chair helps provide safe transfers in and around shower. It allows for virtually total access to users body during bathing. Seat height 21 inch (53 cm). Overall width 21 inch (53 cm); overall depth 20 inch (51 cm). Width between arms 18 inch (46 cm). 300 lb. weight limit. Villa Acacia Wood Shower Bench and Bath Chair Looks meets functionality with this sleek wooden shower stool from Villa Acacia. 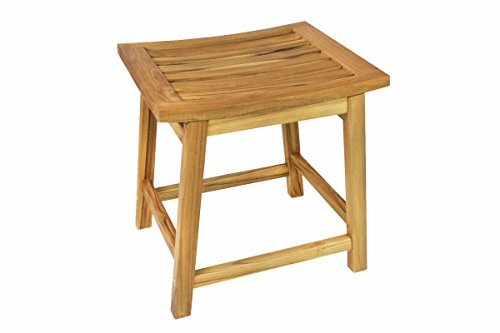 Designed with Japanese and modern influences, this chair is designed to be an attractive stool for your bath, kitchen or outside patio or garden. Designed for sitting, this chair is slightly curved with a ample 17" inch wide seat. This helps provide a snug and comfortable position for sitting. The 18" height is well designed for adults from 5' to 6'3, making it accessible for sitting and showering without having legs dangle or being scrunched up. Reinforced beams connecting each leg, while metal hex bolts connect the legs and seat, so you can rest easy knowing the construction is durable and stable. Acacia is a beautiful and sustainable wood that is grown in the tropical regions. Abundant and hardy, Acacia has the look and feel of teak, but at a fraction of the price while having similar performance. Like teak, Acacia is rich in natural oils, making it resistant to water and the elements. Acacia is a great choice for showers and baths, both indoor and outdoor. Measures 17" wide (side to side, when facing front) x 14" deep and 18" tall. 6 to 10 minutes to assemble, 5/32" allen hex included. 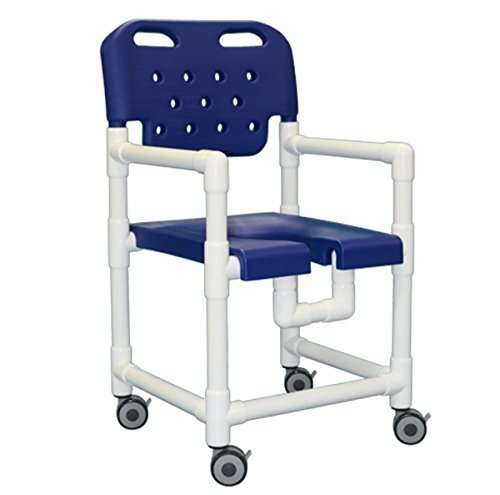 Looking for more Shower Access Chair similar ideas? Try to explore these searches: Marquis Setting, Dk Mens Hooded Zip Sweatshirt, and Brass Head Pins. Look at latest related video about Shower Access Chair. Shopwizion.com is the smartest way for online shopping: compare prices of leading online shops for best deals around the web. Don't miss TOP Shower Access Chair deals, updated daily.